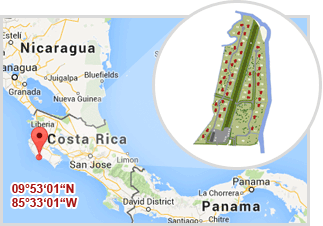 Airpark Costa Rica is situated on the Nicoya peninsula, not far from the Pacific Ocean. Here you will find numerous beautiful bays and beaches all along the coastline and attractive mountain scenery with a great variety of vegetation. The climate varies here along with the different altitudes. While you'll always find a warm, humid climate on the Caribbean side, the average temperature at the “Valle Central” is 20-25 Celsius (68-77 F.) all year round. In contrast, the Nicoya peninsula has a dry period from December until April and a rainy season in September and October. The average air temperature is 28 Celsius (82.4 F.) and the water temperature is 26 Celsius (79 F.).